Richard Dighton’s print of 1821 is sarcastically entitled “One of the Advantages of GAS over OIL” and, as it is from his “London Nuisances” series, demonstates that even thirteen years after the first demonstration of street lighting by gas, the new technology was treated with considerable wariness. Throughout the eighteenth century scientists were aware of the light produced by both coal, wood and natural gases, but could see little practical use for it. Meanwhile streets contined to be dark, dangerous and crime-ridden, the only pools of light the lanterns put out by householders and the precarious illumination of the link-boys’ torches. Often the link-boys could not be trusted to guide the walker safely home and not into the hands of muggers and pickpockets and the air of danger was intensified by the identification of the boys, plunging their flaming torches into the dark snuffers, with illicit acts. The presence of a link boy in a painting was enough to alert the viewer to a sexual sub-text. 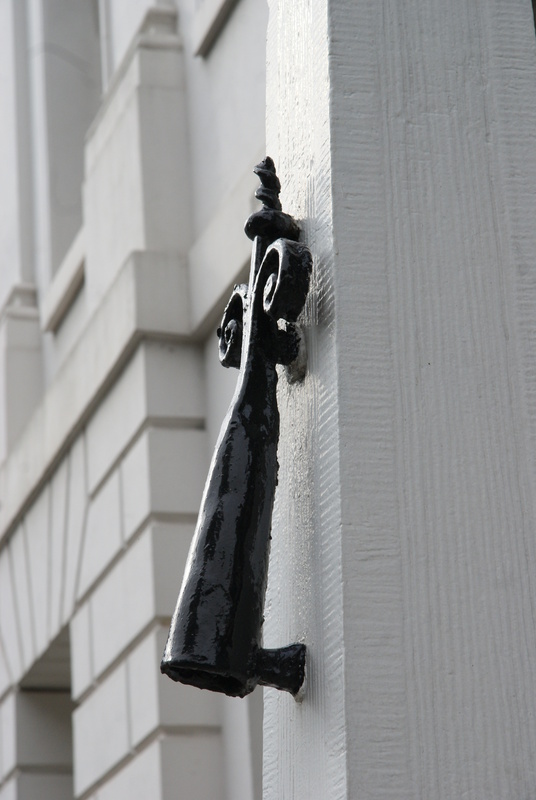 This snuffer is outside Chatham House in St James’s Square. William Murdoch, an engineer working for Matthew Boulton and James Watt at their Soho Foundry steam engine works in Birmingham is the first person known to have lit a house by gas, although, having tried it at home in Redruth, Cornwell in 1792, he did not seem interested in trying to expand on that use. Instead he used gas to light the interior of the Soho Foundry in 1798 and four years later he illuminated the outside in a spectacular public display. Meanwhile a German inventor, Fridrich Winzer, known in Britian as Frederick Albert Winsor, took out the first patent for a gas light in 1802. In 1807 he set up a retort in Pall Mall and produced a temporary display of street lighting on January 28th 1807 for the Prince Regent’s birthday. Prinny became a fan of the new technology and gave it his support. Coal gas contains hydrogen, methane, carbon monoxide and sulphur – smelly, explosive, a fire risk and a definite health hazard and the technology to make it safer lagged beghind the ability to produce it. 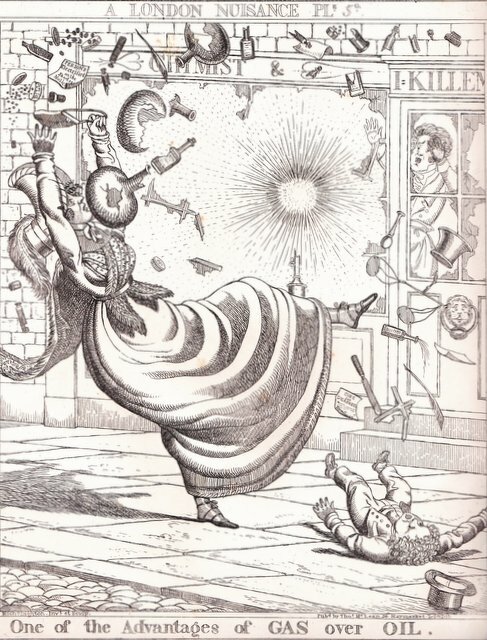 Gas in homes was very rare until the 1840s and did not really catch on until the 1860s when the gas lighting installed in the new Houses of Parliament allayed public fears. Even then the light was from a flame, in effect a powerful candle – the first gas mantle was not invented until 1885. Meanwhile some shops risked introducing it. Entrepreneur publisher Rudolph Ackermann rebuilt his luxurious Emporium in the Strand in 1810 and it was the first shop in London ‘to be lit solely by Gas, which burns with a purity and brilliance unobtainable by any other mode of illumination hitherto attempted.’ But it was slow to catch on , although its benefits for street lighting – and the reduction of crime – were easily appreciated. In 1812 Parliament granted a charter to the London and Westminster Gas Light and Coal Company and on December 31st 1813 Westminster Bridge was illuminated permanently. 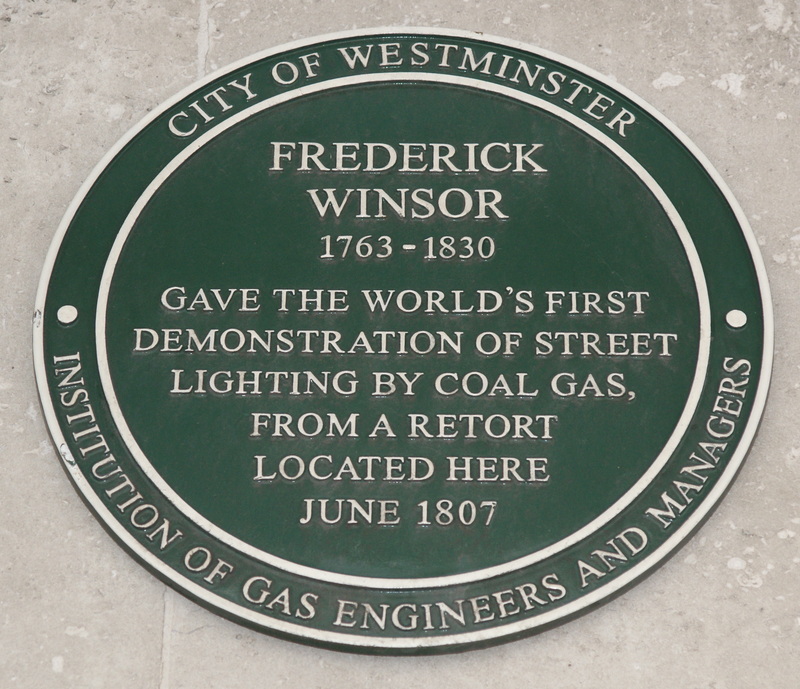 In 1804 Winsor had tried lighting the Lyceum theatre by gas, but it was not until 1817 that it was installed there and at the Covent Garden and Drury Lane theatres. 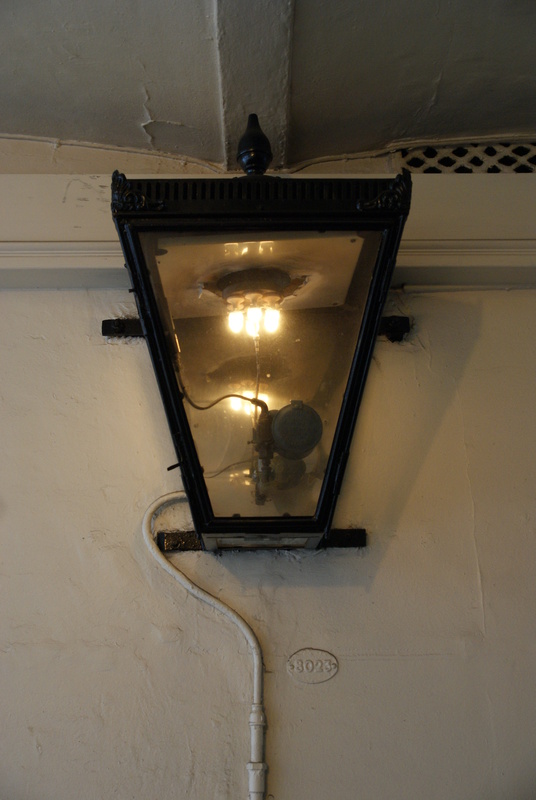 In that year the Chartered Gas Company’s three stations produced 8,500 cubic metres of gas, capable of lighting gas lamps giving the equivalent light of 450,00 candles. Despite the dangers, gas light was here to stay and by 1826 virtually every city and large town in Britain had gas street lighting. There are still gas lights on the streets of London today. Crown Passage, which runs between King Street and Pall Mall, is still very reminiscent of the network of alleys and courts that crisscrossed the fashionable St James’s area – home to gaming hells, brothels and lodging houses on the doorstep of St James’s Palace and Almack’s Assembly Rooms – and it still has gas light and a gas lighter, although when I met him he was simply setting the timing mechanism that turns the gas on and off these days. 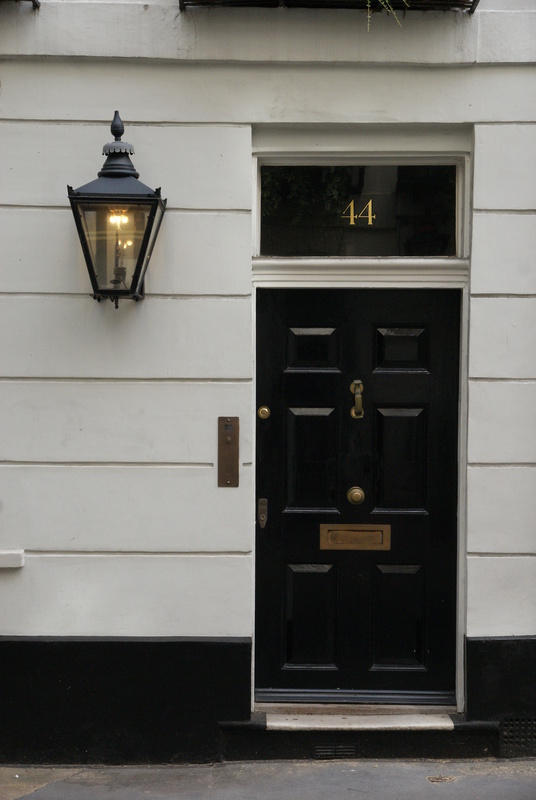 The other gas light shown is on the front of a house in St James’s Place, almost opposite Cleveland Court where Henry Austen, Jane’s brother, had his banking premises for a time.